In order to understand the history and concept of the “Critical Skills,” it is useful to show what they are conceptually in graphic format. Showing the critical skills is done by using a “Skill Field” – shown below. 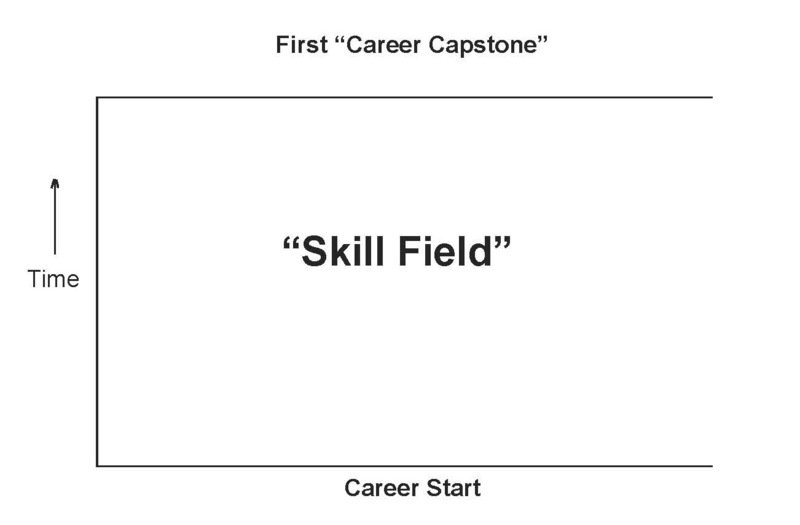 The “Skill Field” is a plot that starts from time zero (at the bottom) to the time when an individual achieved what is called a “First Level Career Capstone” position. This “Career Capstone” position is that position in a company that represents the first level of real responsibility over a functional area or profit center. 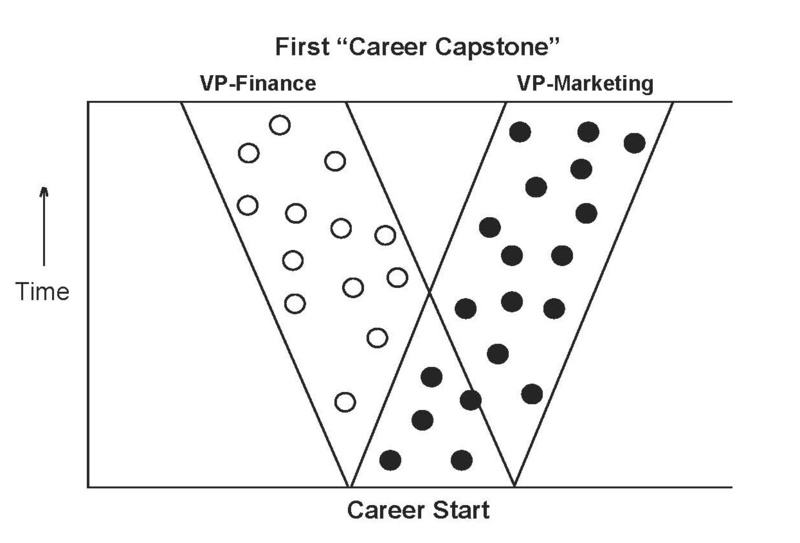 In a service firm such as management consulting firms, accounting firms, law firms, etc., the first level “Career Capstone” is the first level “Partner” position. In the world of education such as a college professor, the “Career Capstone” position might be achieving tenure. 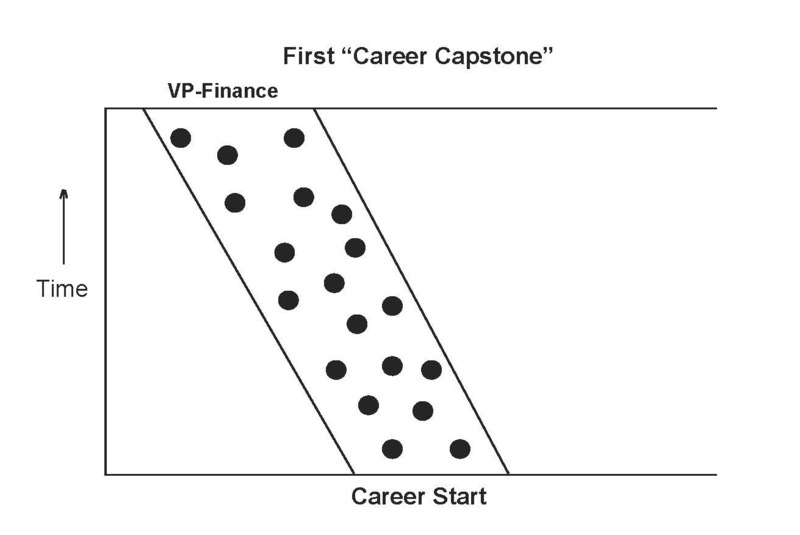 Shown in the next image is an example of the first level career capstone position VP-Finance. The black dots in the image represent the various skills needed by the VP-Finance to do his/her job. This is a complete “Skill Profile” for the VP-Finance. During the course of pursuing a career in finance, an individual would obviously want to develop those skills that qualify her/him for such a position – build a ‘mosaic,’ so to speak. Conversely, if an executive recruiter (headhunter) has been retained to find a VP-Finance for a company, the headhunter will evaluate candidates based on the target skill profile she/he has created specifically for the search, and those who closely fit that profile will be contacted as potential candidates. Smart companies understand the skill profiles and orient their development and training programs to build the skills that fit that profile. Obviously there are positions above this first level capstone position – all the way to the chief executive officer. 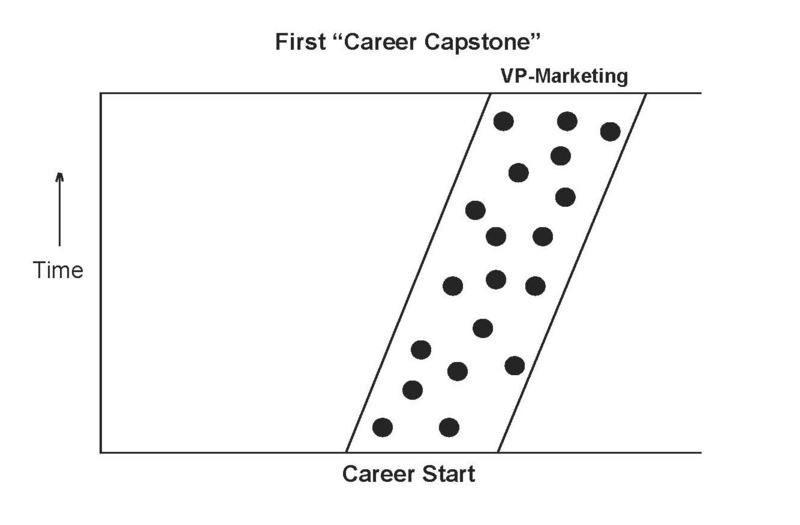 However, in most cases within any organization, one cannot rise ABOVE the first level career capstone unless she/he actually reaches that goal. Accordingly, the first level career capstone position becomes the “target position” for anyone pursuing a career in a corporate environment. 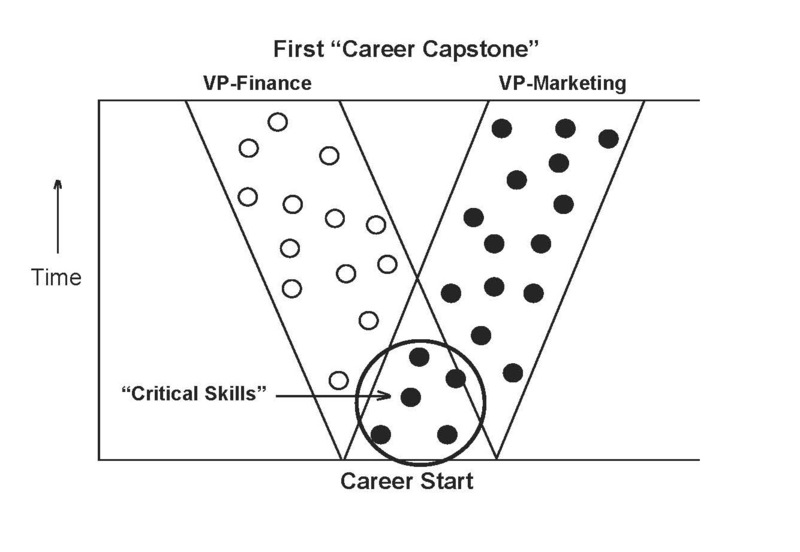 The skill profile for a VP-Marketing is shown below and the skills needed for this capstone position are different from those for the VP-Finance. EXCEPT, as you can see in the image below, the area where each of the two capstone positions share common skills. If we were to show the skill profiles of 30 or so career capstone positions, we would see similar results. There would be different looking skill profiles, to be sure, but . . . there would be some common skills that are needed by all. An excellent question it was, and during the flight back to Chicago, I jotted down a list of 30 “Career Capstone” positions. Then, using the resources and good services of some friendly executive search firms, I gathered about 30 actual position descriptions for EACH of the 30 capstone positions – about 900 in total. This information represented NOT the results of some survey, but ACTUAL recruiting requirements – what corporations were ACTUALLY looking for. Since each executive search came with a fee of approximately $40,000 (at that time), I had in my hands approximately $36 Million worth of solid data! A gold mine! From these 900 searches, I had intended to create 30 “skill profiles” and perhaps publish them in some sort of book intended for the college campuses. However, I was intrigued by the fact that nearly all of the 900 searches had required skills that were common. The WANTED: Eight Critical Skills You Need To Succeed book is available by clicking on the book cover below.